Win a $250 Amazon Gift Card and help protect welders from serious injuries or worse by sharing your experience with a near miss and / or accident that either could have been prevented or was prevented by a SuperFlash or IBEDA Flashback Arrestor. Four (4) $250 Amazon gift cards will be awarded to anyone who shares a near miss, or where a flashback arrestor prevented a near miss and / or accident that we could use in trade publications. The goal is protect welders from serious injury or worse. Submitting your experience is a win-win for you and millions of welders who are protected by SuperFlash IBEDA gas safety products. Or those who should be.. Please email all submissions to sales@oxyfuelsafety.com for your chance to win! Bonjour everyone! Pass the Dijon mustard! Congratulations to Airgas founder Peter McCausland for the recent sale of Airgas to the French company Air Liquide for $10.3 billion. 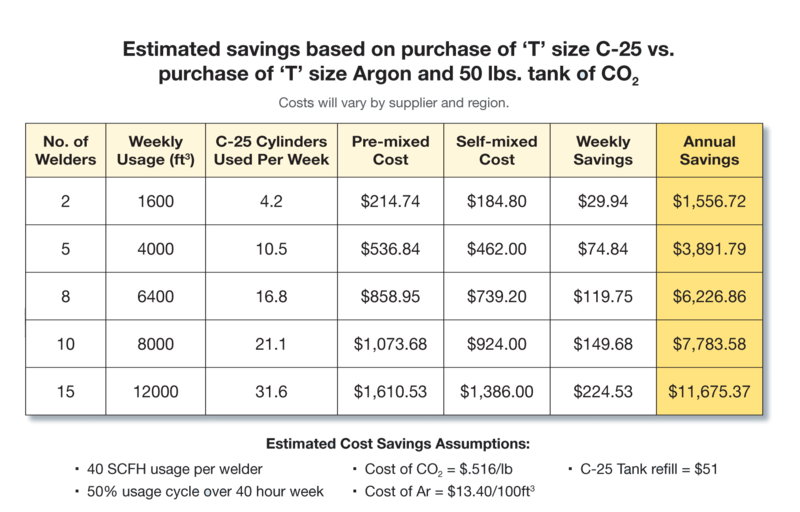 Has there ever been a larger sale in the history of the welding industry? I doubt it. In my view, this created an enormous amount of value for Airgas shareholders, employees, vendors, customers, and our country by implementing a very significant strategy known as overcoming business fragmentation. I first read about this strategy at the Harvard Business School in a famous book titled Competitive Strategy by Professor Michael E. Porter. As I see it, is a great example of brilliantly implementing this very effective strategy in the real world. In Competitive Strategy, Porter describes four critical business advantages that I think are illustrated by this purchase. EXPERIENCE CURVE: Experience is everything. But it can take awhile to acquire. When two companies combine, you can accelerate down the experience curve. In addition to our standard high flow stainless steel flashback arrestor (model DG91NSS), we now offer three additional versions to cover a much larger range of flow rates and situations. Choose from our model DGN for standard flow applications all the way up to our models ESF and Demax designed for high flow manifold applications. Now no matter what application you have, we can provide a flashback arrestor made from stainless steel and suitable for use with higher purity gases, and in more demanding environments. Stainless steel flashback arrestors are designed for oxygen, hydrogen and other flammable gases where all stainless steel type 316 with Viton or other elastomers are desirable. 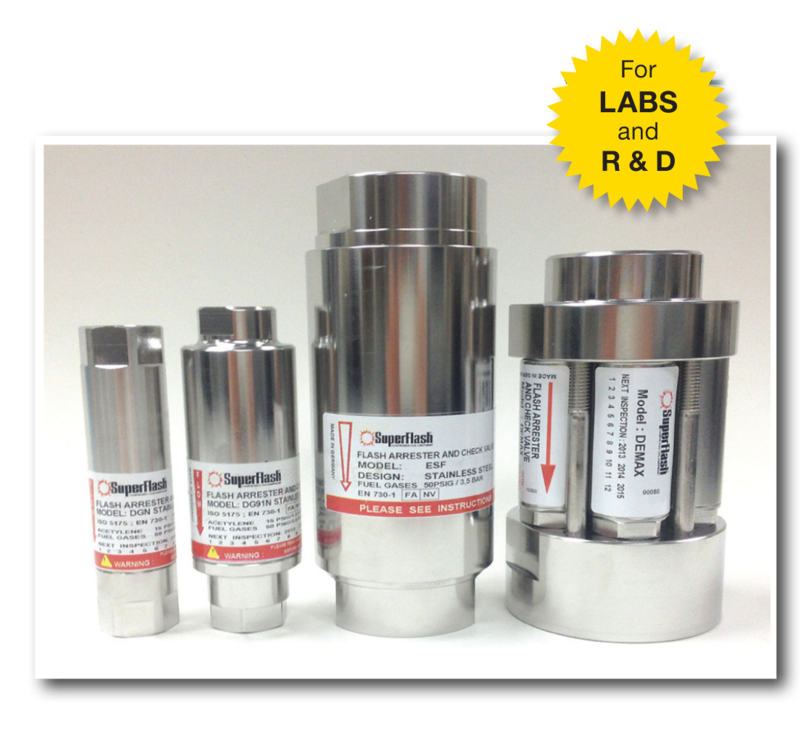 These arrestors are standard with NPT connections; however they can be specially adapted and tested in our lab with a wide variety of connections, including Swagelok tube fittings. 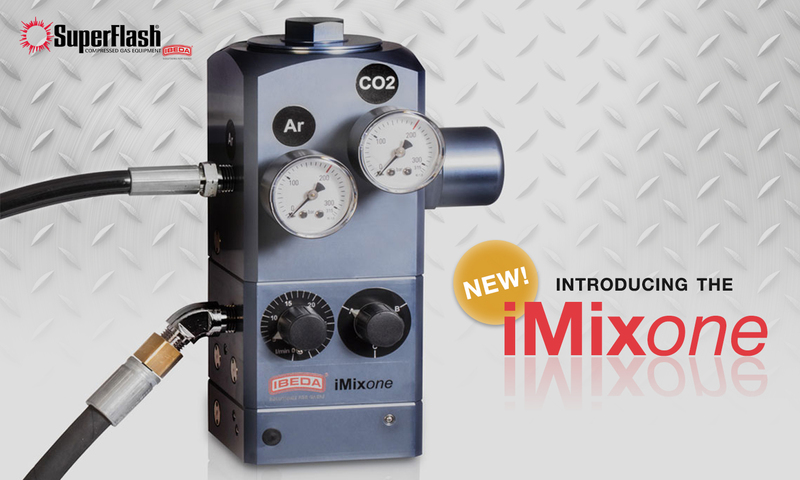 Fully customize and mix your gases! Our friends at IBEDA, Germany created videos about the importance of using flashback arrestors while welding, cutting or in allied processes. Using safety devices, like those manufactured by IBEDA, on a global scale has led to a continually decreasing number of accidents in this industry. IBEDA did a great job of translating this report from German to English, and they created a short video on how flashback arrestors are tested at their facility. See their video below on how flashback arrestors are tested. 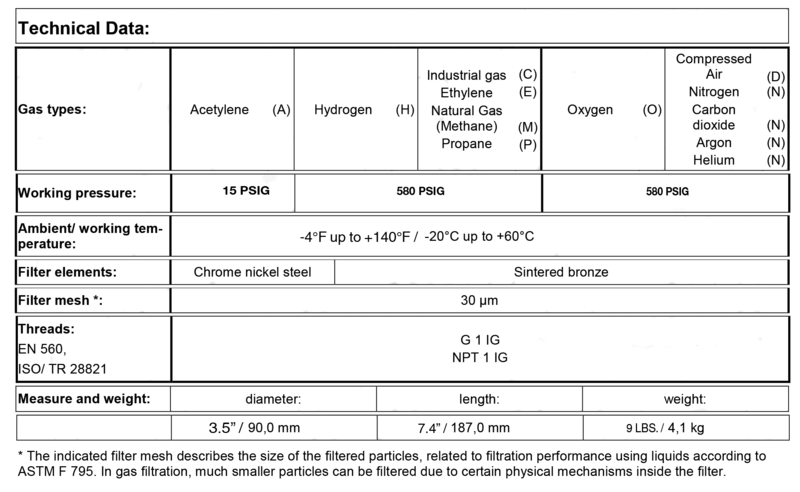 See their PVGD demonstration below. For several years now SuperFlash has been awarding vendors for their superior performance in customer service, timely delivery and quality products. On Feb 1st, 2015, GAWDA wrote about our performance-based awards in the Member News section of Welding and Gases Today. Thank you GAWDA! To read more about the SuperFlash awards, and the GAWDA article click here. IBEDA Germany has New Helium-Vacuum Leak Testing Equipment that has increased production capacity by 50%, thus allowing for further investment in automated manufacturing of gas non-return valves (check valves), gas safety devices and quick action couplings. 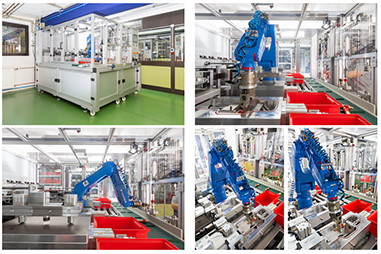 With the new Helium-Vacuum leak testing equipment, production of IBEDA finished producthas increased by 50%. This will enable increased fulfillment for the rising demands ofhigh quality safetydevicesand quick couplers, while keeping reliable delivery and ensuring availabilityof 100% tested high quality products. Every IBEDAarrestoris submitted to a flashback test. With the new testequipment, each unit is additionally testedfor slowreverse flow of gas ( 50cm/h),for external gas tightness ( 8cm/h), fora proper reset function(for products with pressure sensitive cut-off valve) and for leaks once this valve is released( 50cm/h).Hose couplingswith shut-off valves are tested for leaks ( 10cm/h) in both the coupled and uncoupled state. 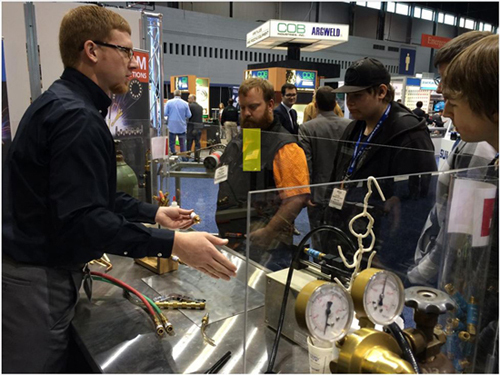 Superflash Compressed Gas Equipment, IBEDA Inc. hosted our Chief Engineer Michael Runkel, from IBEDA Germany at the 2014 Fabtech AWS Show in Atlanta on November 11-13, 2014. We were so glad Michael was able to join us this year, since we officially introduced our chemical line with our Leak Detection Solution at the Fabtech show. We are confident this is going to be a great product line for our customers. Our booth had a lot of traffic this year and Michael participated in product demonstrations, technical, and new product discussions at our booth. 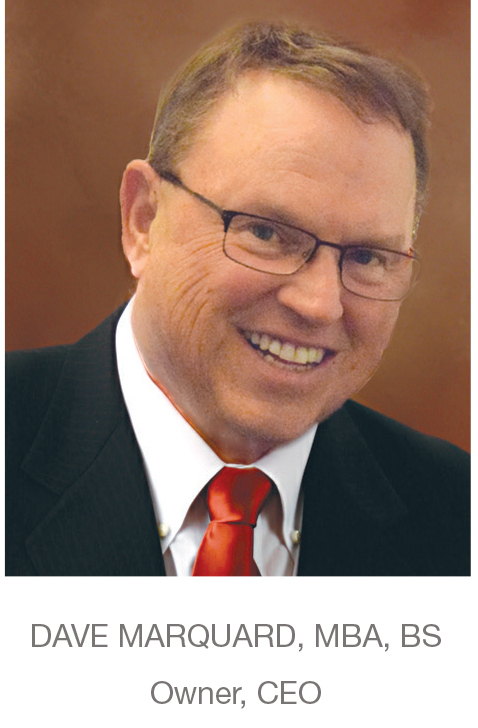 He was a key part of the Superflash / IBEDA team and was very helpful to customers, especially from the Eastern Hemisphere or when they had questions about flame spraying. Michael contributed greatly to our booth at Fabtech and we are excited to see him again soon. On November 14, 2014 Superflash Compressed Gas Equipment O. E. Meyer Company conducted a Safety with Compressed Gases seminar for a 160 participants, at the Lake County Safety Council. Participants were involved in several gas safety demonstrations and discussions, such as properly handling, using, storing, and moving gas cylinders and cryogenic vessels. The seminar also covered an overview of the safety standards from the Compressed Gas Association, Safety Bulletins, and Position Statements along with other OSHA, DOT, and industry practices. Presenters and participants at the seminar included Dave Marquard and Jason Flanigan from Superflash, and Paul Revolinsky, Branch Manager for O.E. Meyer, Garfield Hts Lorain. 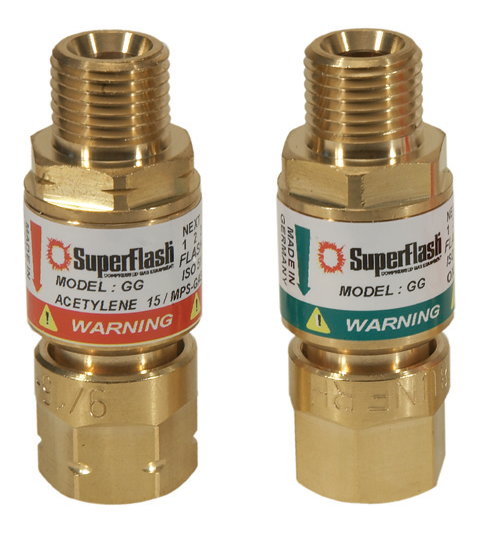 SuperFlash offers flashback arrestors with CGA A size connections (3/8-24UNF) for use with HVAC torches and regulators, jewelry, aircraft torches and regulators, or any application using equipment with CGA A size connections. These flashback arrestors still offer all the benefits of our standard flashback arrestors, just with a size convenient for your smaller torches and regulators. 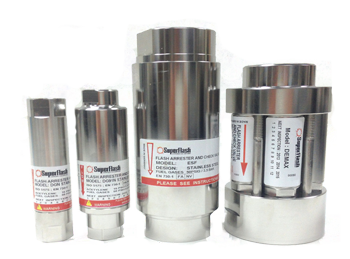 All SuperFlash flashback arrestors are 100% tested in our facilities for flashback protection, reverse flow protection and against leaks. 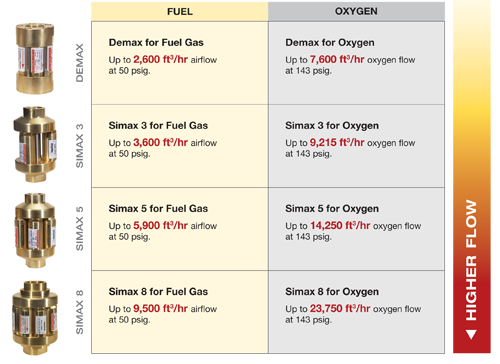 The SIMAX and DEMAX series of flashback arrestors provides a full range of dry (no water or fluid to check or replenish) flashback, gas reverse flow and hose burn back protection in a compact, economical package. They are approved safety devices under ANSI Z49.1:2012 safety guidelines and help meet OSHA, NFPA and other strict industry safety standards. 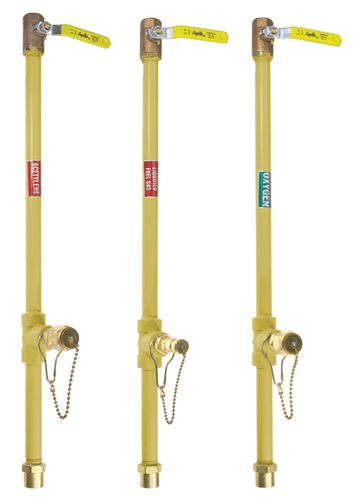 They are ideal for high volume gas flow applications in pipelines and manifolds. The best protection for your high-flow processes, without the high costs or checking liquid levels. Thermal shut off protection against burn backs and multiple flashbacks. More compact than liquid arrestors. Many different connections and flow rate options. 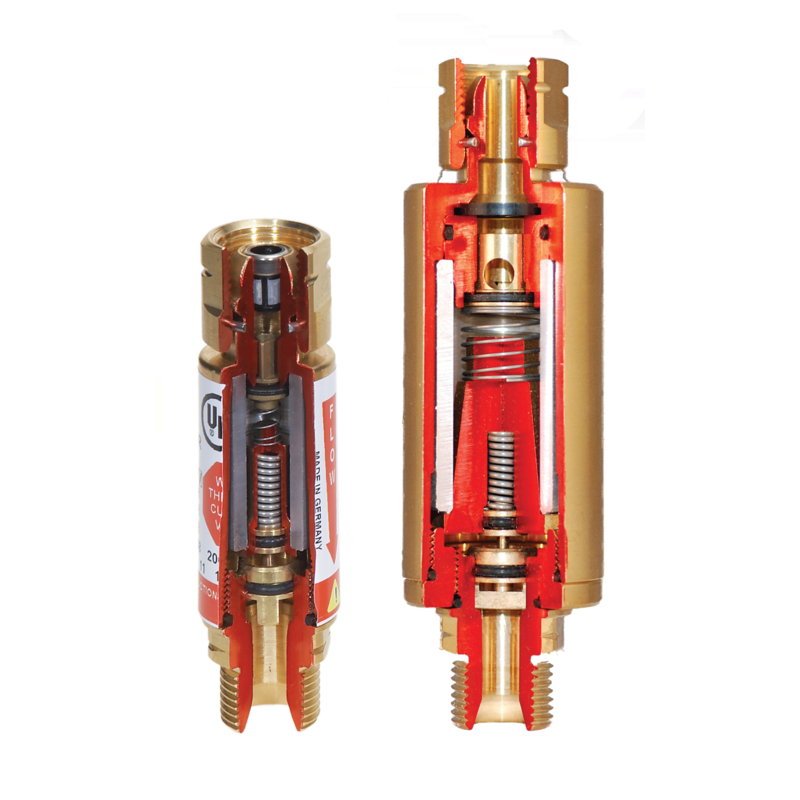 SuperFlash line drops can be installed when performing line maintenance, so you can continue to operate off a reserve gas supply while working on your manifold. Line drops are available to meet your needs and can be customized for special requirements. All SuperFlash line drops come complete with an in-line shut-off valve, drip leg and outlet cap and chain. We carry line drops for many gas services, includingAcetylene, Argon, CO2,Compressed Air, Helium, Hydrogen, Nitrogen, Nitrous Oxide, Oxygen,Propane, LPG, and Fuel Gas. Give us a call for more information on line drops and accessories, 1-888-327-7306. Dont forget - Fabtech AWS, 2014 Where? Georgia World Congress Center 285 Andrew Young International Blvd NW Atlanta, GA 30313 When? November 11-13th, 2014 Our Booth? #C1223 See our famous flashback arrestor demo LIVE at our booth!